Tastes like an old-fashioned red candied apple in a glass! This cinnamon-flavored hot cider is a great way to take the chill off after a play day in the snow. 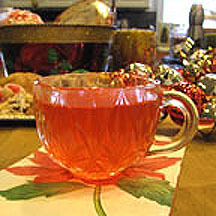 It makes a wonderfully fragrant, hot beverage for serving at fall and wintertime parties, too! Place all ingredients in crockpot and heat on HIGH until candies are melted; stir and reduce heat to LOW. Serve hot. *May also be prepared in a large cooking pot such as a Dutch oven, and heated on the stove top. Nutritional Information Per Serving (1/8 of recipe): 124.5 calories; 2% calories from fat; 0.3g total fat; 0.0mg cholesterol; 8.2mg sodium; 295.2mg potassium; 31.2g carbohydrates; 1.2g fiber; 0.6g sugar; 30.0g net carbs; 0.2g protein.